This is a great show that i listen to at work and it definitely makes the day a bit easier! Have you ever wondered if you count as a geek? Give this a listen. If you understand what they are saying you are well on your way! I just found this show and it's great! You have a new subscriber! Re the post below they had their equipment stolen, so they are off until it is replaced. It is supposed to be in January. This is a great podcast. Very entertaining. I cannot wait for their return. Awesome show. Great geek news and info and tasteful placement of the word sir, sir(s)!! Stop saying "sir" after every sentence. This is a pretty great podcast, but the guy who keeps saying "Sir" needs to stop so badly. After hearing him drop the term at least three times in less than a minute, I almost had to turn the podcast off. When a show starts with Duel of the Fates from Phantom Menace and a truckload of Kevin Smith movie quotes, you're probably in the right place. If you're tired of geek podcasts that are full of negativity and poor production values, look here for relief from the crap pile. Well done, gents, well done. These guys really know what they are talking about. If your a toy/movie/comic guy, this is the podcast for you. I'm a geek...but I'm a busy geek, so I can't stay as up to date as I'd like on alot of the geeky stuff I'd like to.. Enter Big Kev's Geek Stuff. Thanks to the show, I've been able to find out about things I otherwise wouldn't have known about. Even more then giving me the info I'm missing, it's also quite entertaining. Big Kev, Just Mike, and "O.G." Matt move swiftly through the facts but never forget to add a personality that makes BKGS a show worth the listening. This is by far the best geek podcast on itunes. I found this show on XM when I worked there and have listened every since! Keep up the good work guys! Geek Stuff are two righteous dudes!!! I wasn't even a geek when I first heard these guys on XM radio. Now I am fully converted. They really enterain me every week. Great show, really informative and pretty funny. So BKGS needs comments, eh? I saw Matt's MySpace bulletin about Ep. 69 being up a few weeks ago, and although Big Kev's Geek Stuff was one of my MS friends, I had no idea there was a podcast behind it. How did I miss 68 episodes of this stuff??? I'm not a complete geek - a big Star Wars fan, but I was never into comics or collectibles, etc., but regardless, this show is HIGHLY entertaining, and it's quickly become one of my absolutely-must-listen-as-soon-as-it's-out shows. Congratulations on a great show, and I think I'll have to let XM know I've posted this comment... Peace! Your old friend, Brian Jude. As a toy fan and occasional comic book reader, I love thsi show! It covers a variety of news and reviews spanning comic books, movies, tv, toys, and general geekdom in a radio style format. It's really like candy for your ears. I don't have a lot of time for listening to podcasts, but I make time for Big Kev's Geek Stuff. The dynamic between Big Kev, OG and Mr. Fantastic is great. I don't listen for the news, which usually lags a week or so behind, but I do listen for their takes on the news, which is pretty interesting. Their product reviews are very informative and still fun to listen to. I've tried a quite a few podcasts, and where others fall by the wayside, Big Kev's Geek Stuff is one I'll be sticking with for the long haul. I usually don't have time to scrounge the internets for random pictures/videos of movies I'm looking forward to, but all I have to do is check this show out and I save a ton of time. I also haven't kept up on my comic reading, but this is a good way to sift through what I want to check out. I could care less about the toys/action figures/whatever the hell you guys call them, but I still really like the show. Mr. Fantastics recent updates on Xbox/PS3 related news have also been a welcome addition to the show. If you're a fan of sci-fi, super heroes, comics or anything of the sort, you have no reason not to listen to this podcast. One of my favorite podcast's along side of Kevin Smith's "SMODCAST" . These guy's cover it all - toys, comicbooks, movies, dvd's and video games with insightful and witty prose. I have been listening for a few months and have not found another podcast that can match the amount of information being discussed in each episode, espicially in this catagory. My only gripe is that they don't come frequently enough for me. Keep up the good work. They Deserve a Standing & a Sitting Ovation!!! This is a really, really good shoe. . .worthy of much praise and fanfare and celebration. If you don't like fun, then you won't like this podcast. And if you don't like this podcast, ask yourself why you hate the troops. In the Fanboy Nation this is one show that holds our values up on high. This is interesting because I never imagined the words "Fanboy" and "values" would ever be in the same sentence. That's how good this show is. They should have their mics bronzed. 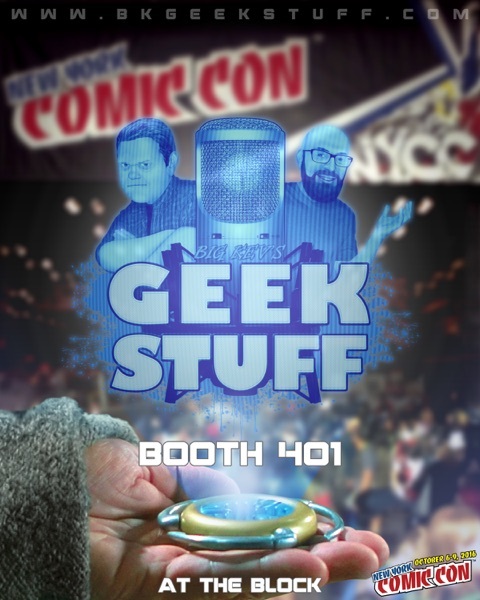 Geek Stuff is by far the best Pod Cast of it’s kind! The hosts really keep the show entertaining while still being informative. They also have the latest inside info in the industry. They really know there stuff form toys to full features films! This is a must listen for any comic/sci-fi/fantasy fan!!! Excellent rapport amongst the crew behind this podcast. With a fine hats off to the radio juggernaut that inspires many of their musings. Clever, funny, informative, entertaining....ugh! Just stop listening to me and click subscribe already, Geek!